Committed philanthropist, volunteer, husband, father, grandfather, and great-grandfather Claris Poppert declared, "Giving should not be painful; it should be one of the most enjoyable acts in life." In the 80s, Claris helped raise the funds to move OMSI from Washington Park to its current location on the southeast waterfront. He was then asked to be the corporate gifts chairman, which encouraged local businesses to support OMSI. Following, he joined OMSI's board and has been involved ever since. Most recently he completed OMSI's Coastal Discovery Center's fundraising campaign to build OMSI's residential camp in Newport, OR, an accomplishment that he easily recognizes as one of OMSI's finest achievements. Claris believes supporting OMSI is creating opportunities for children to be inspired by and engage with science. He points out that our school systems are not set up to do the things that OMSI can. "You can't put everything that OMSI does in a classroom," he praises. "We have the equipment that children can use to solve problems and practice and develop 21st century skills." Claris settled into retirement for the last twenty years, but is not slowing down. He plays golf at least once a week and card games galore: poker, bridge, cribbage, you name it. He likes to point out that he learned to play cards long before smartphones. 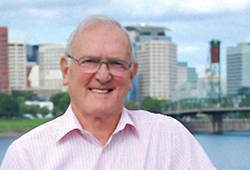 He is involved with his church as a property chairman; he has served on at least 12 board of directors for various non-profits; he is an emeritus trustee for OMSI, a lifetime board member for Willamette University, and has served as state and co-state chairman for several political campaigns. While serving his community, he always makes time to see his children, grandchildren, and great grandchildren. Claris has had the pleasure of working with many leaders in our community and he feels the best-and one of his role models-is our very own Nancy Stueber, OMSI's president for the last 16 years. He lauds her as a marvelous leader that has done so much for science education here in Oregon and beyond. To learn more about how you can make a planned gift to OMSI and become a member of the J.C. Stevens Legacy Society, please contact Catherine Ingvaldsen at (503) 797-4571 or cingvaldsen@omsi.edu. The J.C. Stevens Legacy Society, named after OMSI's visionary founder, recognizes donors who have included OMSI in their estate plan. We are pleased to extend special invitations to exclusive OMSI events and private tours to Legacy Society members. All you need to do is tell OMSI that your plan is in place and that you are willing to be publicly listed on the J.C. Stevens Legacy Society honor roll, setting the example for others to follow. If you wish, your gift can remain anonymous.